There is no substance to multiple media reports that an asteroid passing by Earth on Christmas Eve (Dec. 24) will cause earthquakes on the planet, according to asteroid experts at NASA's Jet Propulsion Laboratory. At its closest approach on Christmas Eve, asteroid 2003 SD220 will be about 6.6 million miles (10.6 million kilometers) from Earth — about 27 times farther than the moon is from Earth. The asteroid will reach its closest point at 8:08 a.m. EST (1300 p.m. GMT) and will not be visible to the naked eye. Despite its small size (only about 1.24 miles, or 2 kilometers wide) and its vast distance from Earth, certain articles are claiming that the asteroid will pose a threat to the planet. The Jet Propulsion Laboratory's Near Earth Object (NEO) Office refuted many of these articles individually via its Twitter account, @AsteroidWatch. "That article is filled with fake and false information. 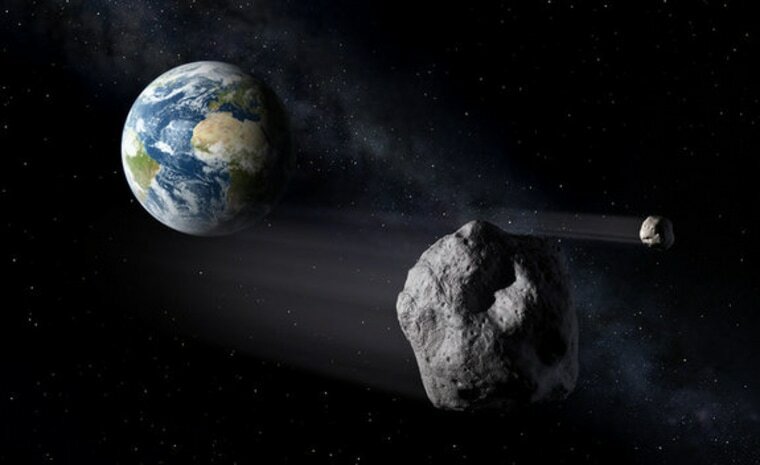 There is no danger from asteroid 2003 SD220," the NEO tweeted in response to a Twitter user who posted an article on an Italian website that claimed NASA had called the asteroid a threat to Earth. @nilgustavito24 @NASA That article is filled with fake and false information. There is no danger from asteroid 2003 SD220. "I wouldn't say it's in 'the news' exactly," @AsteroidWatch tweeted to someone else. "The false stories are in the tabloids. Important difference." The claims about the asteroid's danger also sparked a blog postfrom noted astronomer Phil Plait, who writes the Bad Astronomy blog on Slate. "It certainly won't hit us, and there's no way it can cause earthquakes," he said. "Mind you, asteroids this size pass us relatively often with no effects. And also note that every time one does there are a flurry of breathless, conspiratorial articles on dodgy websites and YouTube videos made by people with user names like 'antinasa illuminati shadowgovernment 1994,' which shouldn’t invoke a lot of confidence, either." Plait added that astronomers do catalog potentially hazardous asteroids and keep the records online for anyone to see. Follow Elizabeth Howell @howellspace. Follow Space.com @Spacedotcom, Facebook and Google+. Original article on Space.com.